Roger Deakin set out in 1996 to swim through the British Isles. The result a uniquely personal view of an island race and a people with a deep affinity for water. From the sea, from rock pools, from rivers and streams, tarns, lakes, lochs, ponds, lidos, swimming pools and spas, from fens, dykes, moats, aqueducts, waterfalls, flooded quarries, even canals, Deakin gains a fascinating perspective on modern Britain. Detained by water bailiffs in Winchester, intercepted in the Fowey estuary by coastguards, mistaken for a suicude on Camber sands, confronting the Corryvreckan whirlpool in the Hebrides, he discovers just how much of an outsider the native swimmer is to his landlocked, fully-dressed fellow citizens. Encompassing cultural history, autobiography, travel writing and natural history, Waterlog is a personal journey, a bold assertion of the native swimmer's right to roam, and an unforgettable celebration of the magic of water. The British Isles are blessed with a whole variety of waterways often encompassed within beautiful valleys, rolling hills, green fields and rugged coast lines. The presence of a flowing stream, waterfall or an idyllic pond can enhance a picturesque landscape. While swimming in the moat located in his own back garden, inspired by thoughts of his son's current quest travelling in Australia and John Cheever's classic short story, The Swimmer, Roger Deakin decided he would undertake his own adventure and swim across Britain. The Rambling Association's Right to Roam campaign is well publicised in the UK, so should that not include our right to swim in our lakes, dykes, and tarns? Deakin was ready to prove it did and planned a trip around Britain which would take him to numerous wild swimming venues. 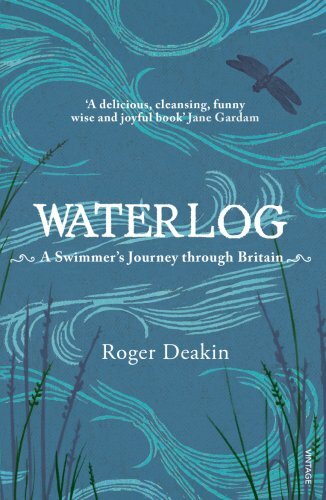 Waterlog, is Deakin's account of his journey. He seeks out tarns high in the hills of north Wales, swims with salmon in Somerset and eels in the Fens. He describes the nature he sees around him from his unusual perspective inches above water level. His love of swimming away from the confines of a swimming pool comes through strongly in his writing. Wild swimming is an unusual hobby in modern society as we are constantly told how our rivers and lakes have become polluted by large industries disposing of waste via waterways and chemical fertilisers washing off farmers fields into out rivers. During his visit to a weir on the River Avon in Worcestershire, Deakin's hosts and fellow swimmers show him a letter they have received from the local environment agency outlining the dangers of swimming in the river. The letter describes how sewage can constitute up to 80 percent of the river flow and increase the risk of catching Weil's disease. Deakin takes in the scientific argument, arguing that the figures show that very few people catch Weil's Disease in the UK and of those who do, they are invariably not river swimmers.